Courgette is a versatile vegetable which is delicious roasted with herbs and olive oil. These easy mozzarella veggie dippers are quick and can be eaten hot or cold. Perfect for summer eating and delicious for kids too! Chop the top and bottom off the courgette, and using a vegetable peeler, strip the courgette into slices (lengthways), place these aside. 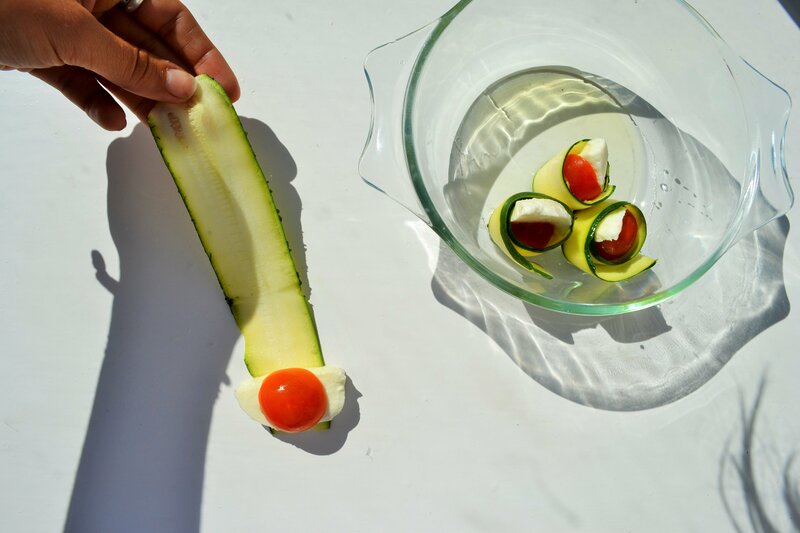 Chop the tomatoes in half.Then, cut the mozzarella into small lengthways pieces that you can use the courgette to wrap around. 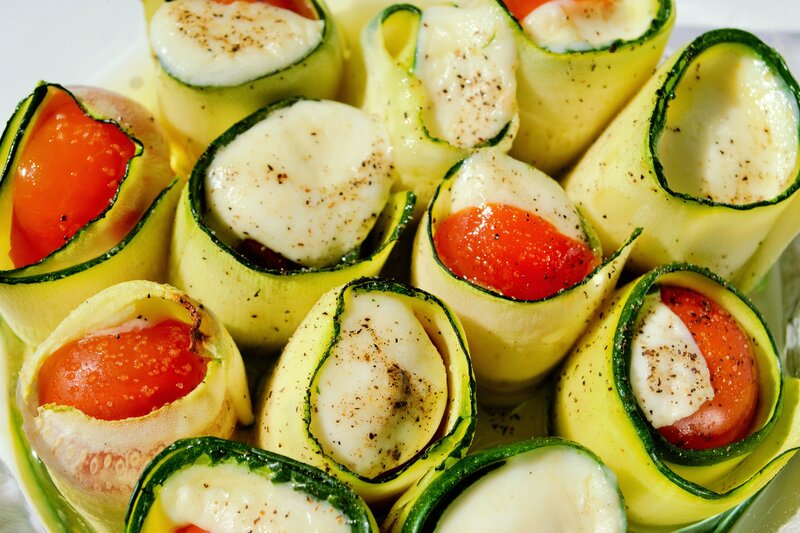 Preheat the oven to 180 degrees celsius.To make the courgette wraps, take one piece of courgette and place a piece of tomato and mozzarella in the middle. 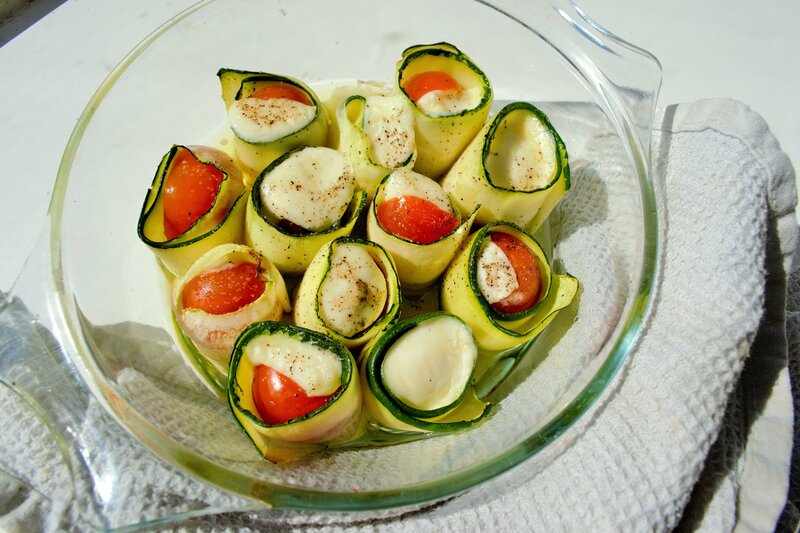 Wrap up the filling by rolling the courgette around, like shown in the picture below. Continue this process until all the ingredients are used up, while placing each roll upright in a baking dish.When this is complete, drizzle some olive oil over the rolls, and season with salt and pepper. Place in the oven for 15 minutes, watching carefully so that they do not burn but cook slowly.Remove from the oven and serve immediately. You can alternatively allow to cool and keep in the fridge for up to two days.